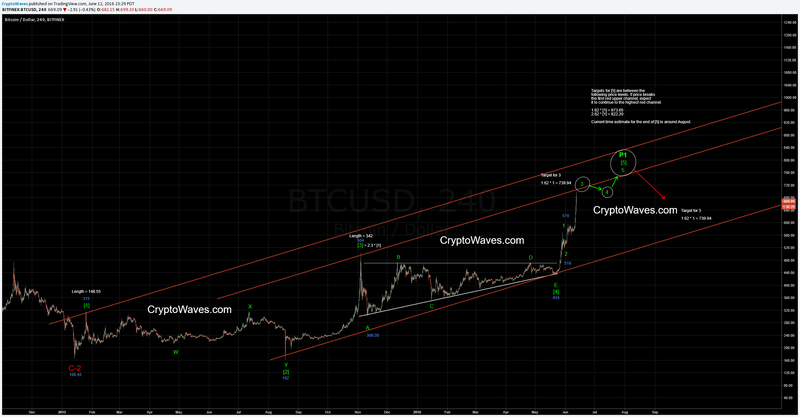 By my count, Bitcoin price is currently rising in a Wave 3--P1 move higher. The 1.62 * Wave 1 extension of the move is at 739.94. I expect bitcoin price to hit some resistance around that area, shown by the first white circle. The new red trendlines are a parallel channels, with slope matching the line connecting the wave  and wave  bottoms. The target for the end of wave  is within these red channels. Early resistance in price upward movement may come at the first red channel line. Fib targets for the end of Wave  are between the following, also shown on the 4-hour chart below. Price should not move straight up to the end of wave . Expect some sideways chop for wave 4- before the final move up for wave 5-. Another triangle for wave 4 would fool the most traders and create a base for the final move of P1. This wave count is a slight revision from my previous wave count which had the BTC top at 504 in November 2015 labelled as the end of P1. Instead, I call that top wave  of P1. I feel that this wave timing matches much better, since my previous count had wave P2 lasting a too short an amount of time. Also, the sideways movement that occurred since that top at 504 counts very well as a A-B-C-D-E triangle for wave . The end of wave -P1 will be followed by a drop for wave P2. Before projecting price targets for that move, let’s concentrate on charting the current move up – P2 targets cannot be extrapolated until the end of P1 is reached. Material from the CRYPTOWAVES blog site may be reproduced or shared online, provided full attribution is given to CRYPTOWAVES and the original article web source is linked. Ignoring the above will be considered a violation of copyright. The content on this site is provided as information only and should not be taken as investment advice. All site content, including advertisements, shall not be construed as a recommendation to buy or sell any security or financial instrument, or to participate in any particular trading or investment strategy. The ideas expressed on this site are solely the opinions of the author and are for entertainment purposes only. Read at your own risk and as entertainment only. Any investment decision that results in losses or gains made based on any information on this site is not the responsibility of the author. The author may from time to time make statements about certain investment vehicles and strategies, but it is not to be taken as investment advice. Again, it is just the author expressing his opinion only. Past performance is no guarantee of future results.